Copyright notice: Links to this site are welcomed. However none of the material on the site may be duplicated in any form. The copyright of the articles is the property of the authors. Copyright of the web pages is the property of David McClure. This article was first published in Ayrshire Notes 31 (2006), 4-9. James McAdam of Waterhead (c.1716-1770), father of John Loudon McAdam, built Lagwine (also 'Lagwyne') 'castle' at Carsphairn, resided for a time in Ayr - reputedly at the time of John Loudon's birth - and died at Whitefoord House. This much is generally accepted. Through a study of window tax records [WTR], these movements have been traced and his periods in residence at his various houses identified within the limits of the six or twelve month taxation periods. By 1797-1798 Ochiltree House (NS 510 212) was apparently absent from the WTR, but the 14-windowed house occupied by the Rev. Thomson was probably the habitable portion of the larger edifice. He described it as 'an old mansion house, situated at the east end of the village of Ochiltree, which is the present residence of the minister, the manse being entirely in ruins.' By 1856 the house had been derelict for many years: 'Ochiltree House, the property of the dowager Lady Boswell, is a plain building, three storeys high, with crow-stepped gables and a slate roof. It is in bad repair and becoming ruinous. Attached to and occupying the E front of the mansion is a ruin, about 12ft high, divided into apartments. Its walls are about 6ft thick and part of an arched roof is still entire. It has the appearance of having been a castle of some strength. It must have been unoccupied for a long time as there are large trees growing within it.' The house was brought back into habitation later. There are records of additions to the building in 1891, possibly for James Angus, coalmaster and elder brother of Robert Angus of Ladykirk. He was the occupier c.1900 and until his death in 1902. Though the building is tall and plain-looking, with narrow windows and pointed gables, its architectural defects are fully compensated for by the beauty of its situation at the meeting of the waters. In November 1753 to May 1754, and May 1754 to May 1755 McAdam continued in Ochiltree parish. but in a house with 18 windows. Glencairn's house was 'not inhabited', and thus no tax was due on it. The last period for which McAdam is found in the Ochiltree WTR is Whitsunday to Martinmas 1755, for which his name appears as occupier against the house of 18 windows, but it was 'not uninhabited'. But what of Waterhead? McAdam's barony of Waterhead was in the Kirkcudbrightshire parish of Carsphairn. There was no entry for a house of that name in the WTR for Whitsunday to Martinmas 1753, when three dwellings in the parish were taxed, nor in any subsequent period. This indicates a house of no more than 9 windows. Waterhead was a mean dwelling compared to McAdam's Ochiltree homes. It was also very remote, lying about 3½ miles north of Carsphairn beside the Water of Deugh. 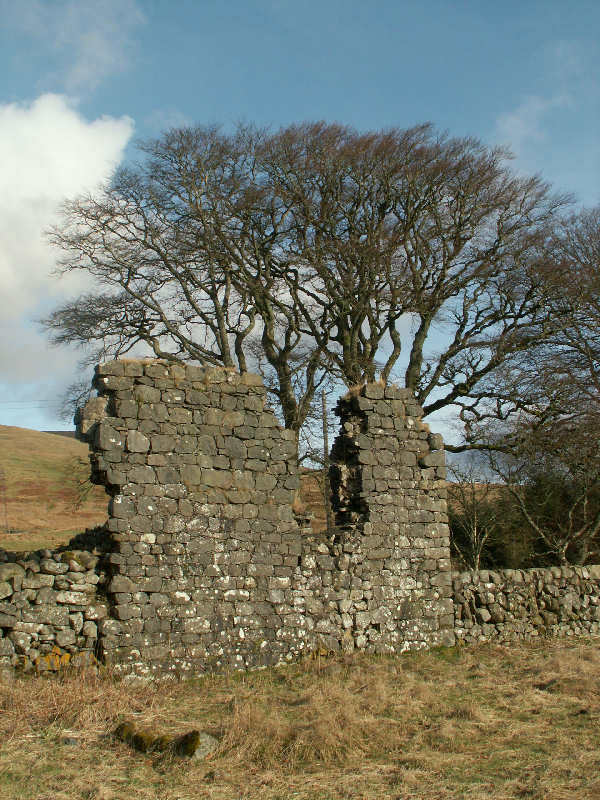 McAdam's new house of Lagwine, just over half a mile from Carsphairn church and on the rutted unmade road from Dalmellington, appeared first in the WTR in Martinmas 1754 to Whitsunday 1755. It was recorded as having 13 windows and being 'not finished'. In subsequent periods it was 'not inhabited'. McAdam was not liable for tax there until Whitsunday to Martinmas 1757. From May 1755, when he left Ochiltree, until Whitsunday 1757, when he occupied Lagwine, McAdam could have been residing at Waterhead, and not troubling the tax records. He was, however, occupying a house of 17 windows in Ayr. He was there first in May 1755 to May 1756 and remained until May 1759 to Whitsunday 1760. John Loudon was born on 23rd September 1756, during McAdam's time in Ayr and when Lagwine was 'not inhabited'. The house McAdam occupied in Ayr has been identified, possibly only by tradition, as 'Lady Cathcart's house' in Sandgate, though there is ambiguity over the identity of the lady in question. According to the plaque on the building, the house was owned by Lord Elias Cathcart, and it is named after his widow. However, there was no 'Lord Elias Cathcart'. Charles Schaw Cathcart (1721-1771) succeeded as ninth earl of Cathcart in 1740, and was the sole Lord Cathcart at that time. The earls of Cathcart were significant landowners in Ayrshire, their estates including Sundrum and Auchencruive. With the disposal of the latter to Richard Oswald in 1764, Schaw Park in Clackmannan became the family seat. In May 1755 Charles Cathcart was the owner of an uninhabited 18-windowed house in Ayr. Another 18-windowed house was occupied by Baillie Cathcart: i.e. Elias Cathcart, a tobacco and wine merchant, who was admitted a burgess and guild brother of the Royal Burgh in 1733, and served as provost in 1757-1759. James McAdam is listed separately as the occupier of a house with 17 windows. Thus he lived neither in the house then occupied by Elias Cathcart, nor in the uninhabited house belonging to Lord Charles Cathcart, though since the owner of the house he did occupy is not recorded, it could well have been the property of either of them, or, indeed, it could have belonged to someone else entirely. As to 'Lady Cathcart', it may be noted that the widows of untitled landowners were frequently termed 'Lady'. Georgina Keith McAdam, daughter of John Loudon McAdam, later recorded that 'Great Grandmama was a very stately lady and never gave up her title of Lady Waterhead', a dignity rather than title arising from the barony of Waterhead. The 1755 WTR show that Ladies Brownhill, Trochrige, Achenskeith, and Dunduff, none of them the widows of lords, baronets, or knights, were also then occupants of houses in Ayr. Elias Cathcart acquired a small estate in Alloway; this, and his important position in the burgh, appears to justify his widow's courtesy title. Lagwine proved to be a short-lived venture. For the year Whitsunday 1757 until Whitsunday 1758 he was liable for tax on 13 windows. In the following period, Whitsunday to Martinmas 1758, the record shows 8 windows and only house tax was levied. A window could be discounted for tax only if it were 'stopped up', which required it to be filled with stone or brick, or plaster or lath, or with the same materials as on the outside of the house. Just a year after entering his new 'castle' at Carsphairn, McAdam had taken steps to reduce its size or to stop up 5 of its windows. Until Whitsunday 1760 he was also paying tax on his house in Ayr. He continued paying house tax on Lagwine until Whitsunday 1763, following which it disappeared from the records, having been destroyed by fire in December 1762. While still in the cradle, [John Loudon McAdam's] father and mother, going on a visit to Edinburgh left him at their house of Lagwyne, parish of Carsphairn, in charge of his elder sisters and a nurse. During the parental absence the house took fire as evil chance would have it, in the middle of a winter night, the flames gaining so rapidly that the family had to seek refuge (some of them in their night-dresses), on the bleak hill side covered with snow. While from this unenviable position they stood helplessly gazing at their house enveloped in smoke and flame, it was observed with horror that the little one in the cradle had been forgotten. The nurse crying out "Am I going to add murder to arson" (it seemed her carelessness had been the cause of the fire), rushed back and at considerable risk to herself, saved her charge from the flames. To reach the nearest place of shelter, the party now homeless wanderers, carrying Loudon in their arms, had to make their way as best they could on foot, over half a mile of dreary upland rendered still more desolate by snow and darkness. After a weary tramp and much suffering they reached at last the manse of Carsphairn, where they were hospitably received by the good minister. 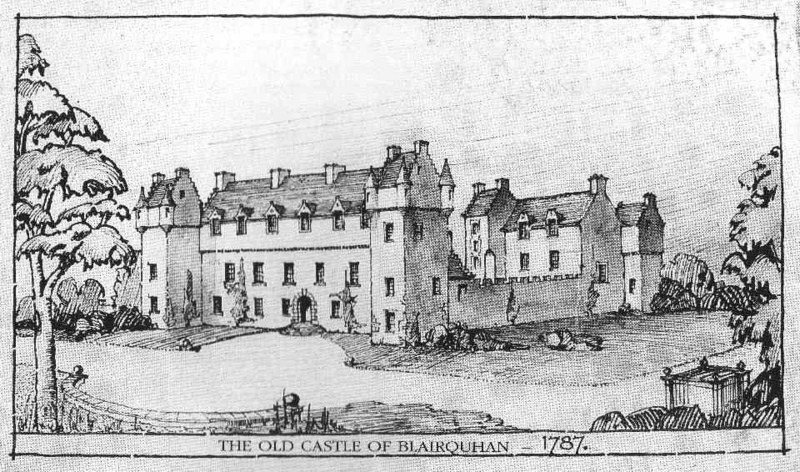 reproduced from the Blairquhan guidebook by permission of Patrick Hunter Blair. It might have been speculated that the elimination of windows at Lagwine, thus reducing the tax liability, was an economy measure. His reputation however, and the grand houses he occupied in Ochiltree and Straiton, suggest that there may have been another cause. During his decline McAdam sold his Waterhead estate to the earl of Stair. John McAdam of Craigengillan, a distant relation but a close associate, acted for him in the business. Craigengillan's intentions may not have been honourable: a few years later he purchased the estate from the earl, a matter which gave rise to considerable resentment on the part of the Waterhead McAdams, who felt that they had been cheated out of their inheritance. 20 Geo. II c.3, 1746, National debt. 31 Geo. II c.22, 1757, Pension duties. 2 Geo. III c.8, 1761, Window duties. 18 Geo. III c.26, 1778, House duty. E326/1/16, April 1789-April 1798 (April 1795-April 1797 wanting). The Scots Peerage, vol. IV (Edinburgh, 1907), 250-252; Alexander Murdoch, Ochiltree: Its History and Reminiscences (Paisley, 1921), 74-79. Old Statistical Account (1791-1799), vol. V, Rev. William Thomson, Ochiltree, 448. Ordnance Survey Name Book, 1856. Information from Rob Close: Building Industries, Vol 1, no 12, March 1891, and Vol 2, no.1, April 1891, also Ayr Advertiser 19 February 1891; also the notes on James Angus. NAS, Window Tax records for Kirkcudbrightshire, E326/1/59-60. NAS, Window Tax records for Ayr: E326/1/134, March 1748-September 1748, May 1760-April 1798 (May 1753-May 1760 see vols. 11 and 12; April 1784-April 1785 see vol. 217; April 1795-April 1797 wanting). Alistair Lindsay and Jean Kennedy, eds., The Burgesses and Guild Brethren of Ayr 1647-1846 (Ayrshire Federation of Historical Societies, 2002), 126; John Strawhorn, The History of Ayr: Royal Burgh and County Town (Edinburgh, 1989), 115, 284. Georgina Keith McAdam, 'The History of the Waterhead McAdams and the McAdams of Craigengillan'. (unpublished manuscript, 1854). An investigation and partial excavation of the ruins is reported by Alastair M.T. Maxwell-Irving, 'Lagwyne Castle (NX 558 939)', in Transactions of the Dumfriesshire and Galloway Natural History and Antiquarian Society, Third Series Vol. LXXI (Dumfries, 1996), 163-165. This letter dated 27th December 1762 is cited in Frederick A. Pottle, ed., Boswell's London Journal, 1762-1763 (Yale, 1950), editor's note to entry for 14-15th September 1762. Mgr D.S. Ramsay, 'Biographical Sketches of some Ayrshire people of the last and present centuries', 1883, 59-60; unpublished manuscript in Carnegie Library, Ayr (South Ayrshire Libraries). Captain Armstrong and Son, A New Map of Ayrshire, comprehending Kyle, Cunningham, & Carrick (1775). Michael C. Davis, The Castles and Mansions of Ayrshire (Ardrishaig, 1991), 181. Rob Close, Ayrshire & Arran: An Illustrated Architectural Guide (RIAS 1992), 188-189. Scots Magazine, XXXII (1770), 458. 'A. Cochrane', Castle Canon, to her brother [name unknown], 1st December 1770, Shaw Kennedy MSS., cited by Spiro, 'John Loudon McAdam'. McAdam actually had 7 unmarried sisters at the time. An account of this will be given in a subsequent article.